The most common histological type of pancreatic cancer is ductal adenocarcinoma, which accounts for over 90% of all tumors. Most pancreatic cancers are advanced at the time of diagnosis. The overall 5-year survival rate is 4%. Because the 5-year survival of this condition is so poor, incidence and mortality rates are virtually identical. At the time of diagnosis, approximately 80% of all pancreatic cancers are advanced. The 5-year survival of operated patients approaches 40% when performed at specialized medical institutions. Pancreatic cancer is rare before the age of 45 years and 80% of cases occur in the 60–80 year age group. The three main symptoms of pancreatic cancer are pain, loss of weight, and jaundice. However, signs and symptoms are non-specific. Cases of pancreatic cancer are defined by image guided biopsy, surgical resection or intra-operative biopsy, or suggestive imaging features with a progressive and compatible clinical course on follow up. The incidence of pancreatic cancer in India hastraditionally been thought to be low (0.5-2.4 per 100,000 men and 0.2-1.8 per 100,000 women). However, this is likely to be a reflection of under-recognition and under-reporting. The incidence of pancreatic cancer is higher in the urban male populations of western and northern parts of India. Time trends show that the incidence is increasing for both carcinoma of the pancreas and also peri-ampullary tumors. The annual pancreatic cancer load of India in 2001 was approximately 14,230 patients: the estimated current figure is approximately 17,000 and is likely to increase in the near future. 1) Chronic pancreatitis, including autoimmune pancreatitis. 2) Acute pancreatitis, including focal pancreatitis / pseudo-tumoral pancreatitis / groove pancreatitis. No simple screening test is available for the general population. The strongest etiological association of pancreatic cancer is with cigarette smoking. 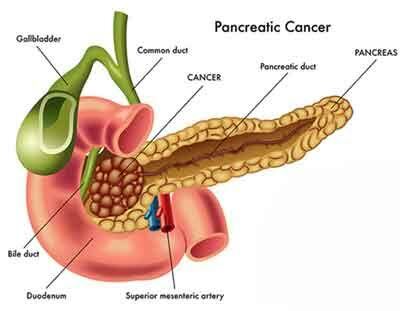 Hence health education to reduce tobacco consumption should lower the risk of developing pancreatic carcinoma. Other high-risk groups include patients with chronic pancreatitis, adult onset diabetes of less than two years’ duration, hereditary pancreatitis, familial pancreatic cancers, and certain familial cancer syndromes. However, there are no screening or preventive guidelines for these higher risk groups. 2) Computerized tomography (CT) scan. 3) Magnetic resonance (MR), including magnetic resonance cholangiopancreatography (MRCP). Endoscopic retrograde cholangiopancreatography (ERCP) is now seldom used for the primary diagnosis. However, it can be used to obtain intra-ductal tissue for diagnosis, when biliary drainage is planned. Pancreaticoduodenectomy (with or without pylorus preservation) is the most appropriate resectional procedure for tumors of the pancreatic head. Left sided resection (with splenectomy) is appropriate for localized carcinomas of the body and tail of the pancreas. Involvement of the splenic vein or artery is not in itself a contraindication to such resection. (2) Venous involvement of the SMV/portal vein demonstrating tumor abutment with or without impingement and narrowing of the lumen, encasement of the SMV/portal vein but without encasement of the nearby arteries, or short segment venous occlusion resulting from either tumor thrombus or encasement but with suitable vessel proximal and distal to the area of vessel involvement, allowing for safe resection and reconstruction. (3) Gastroduodenal artery encasement up to the hepatic artery with either short segment encasement or direct abutment of the hepatic artery, without extension to the celiac axis. (4) Tumor abutment of the SMA not to exceed greater than 180 degrees of the circumference of the vessel wall. Gemcitabine or gemcitabine-based combination therapy may be considered as initial therapy prior to 5-FU-based chemoradiation. All tumors with metastases to lymph nodes beyond the field of resection should be considered unresectable. Surgery for palliative purpose is now rarely indicated. It may have some role in resourcelimited setting. It may also be indicated if the patient is found to be unresectable during laparotomy. Duodenal and biliary bypass should be used during palliative surgery. The biliary bypass should be constructed with the bile duct in preference to the gall bladder. 2.1 Patients should have access to palliative care specialists. Pain relief should be achieved using a progressive analgesic ladder. 2.2 Patients with pancreatic head tumors, who require relief of jaundice will need biliary stenting. Endoscopic stent placement is preferable to trans-hepatic stenting. Both plastic and self-expanding metal stents (SEMS) are effective in achieving biliary drainage but SEMS are preferable for patients with longer life expectancy (more than 6 months). Currently, the choice between these stents depends on clinical factors, local availability, and local expertise. Plastic stents have been traditionally placed to relieve jaundice before surgery. However, covered SEMS can also be placed without compromising the surgery and afford a faster relief of jaundice. 2.3 Gastric outlet obstruction can be palliated with enteral SEMS. 2.4 Treatment of associated depression. 2.5 Pancreatic enzyme replacement for pancreatic insufficiency. 2.6 Low molecular weight heparin for prophylaxis of thromboembolic disease. 2.7 Gemcitabine is considered the standard front line chemotherapy for patients with metastatic disease. Gemcitabine combinations have shown a favorable impact on time to progression or survival for patients with good performance status. 2) CA 19.9 levels (CA 19-9 may be elevated in cases of benign biliary obstruction and does not represent an appropriate baseline until the patient is decompressed. In addition, CA19-9 may be undetectable in Lewis-a negative individuals). 3) Chest imaging. 4) Abdominal ultrasound. 5) CT or MRI scanning. 1) Nutritional build up and early referral for potentially resectable patients. 2) Symptom palliation for unresectable patients. 1) Suspected carcinoma pancreas, where the diagnosis cannot be established with the existing resources. 2) Potentially resectable patients for further staging. 3) Potentially resectable patients for pancreaticoduodenectomy surgery to a high volume center. 4) Unresectable patients, with specialized palliation needs, like celiac plexus neurolysis, patient controlled analgesia, stenting for relief of biliary obstruction e.t.c. 3) Laparoscopy and laparoscopic ultrasound. 4) Guided biopsy techniques for patients considered not suitable for surgical resection. If biopsy is required in a resectable lesion, then EUS-directed FNA biopsy is preferable to a CTguided FNA because of lower risk of peritoneal seeding with the former. Biopsy proof of malignancy is not required before surgical resection and a non-diagnostic biopsy should not delay surgical resection when the clinical suspicion for pancreatic cancer is high. 1) Facilities for assessment of resectability. 2) Increased therapeutic resources, including oncologic treatment. 3) Adequate surgical expertise for pancreatic resections. 4) Specialized services in histopathology, intensive care, and palliative care. 5) Facilities for the organization and conduct of local, national, and international trials. a. Doctor Clinical evaluation, decides investigations, interprets the investigations, and generates a treatment plan. b. Nurse Ensures adequacy of palliative care, and carries out the treatment plan. c. Technician Carries out the investigations planned.